It’s a shame that Lambic is so far away from the train station but needs must. It’s a great little bar with a fun chilled out environment with good beers on tap – what more could you want from a bar? I’ve long been accustomed to beer glasses in Japan being smaller than the UK sizes but Lambic’s beers are great value for money. Prices include tax and there isn’t a table charge either at the end of the day. There wasn’t any WiFi so for those looking to read BeerTengoku or update Untappd then you’ll have to wait. The menu was in Japanese too but the staff helpfully explained in English too and the whole bar was non-smoking as well. Just a first floor shot – second floor was closed at lunch. 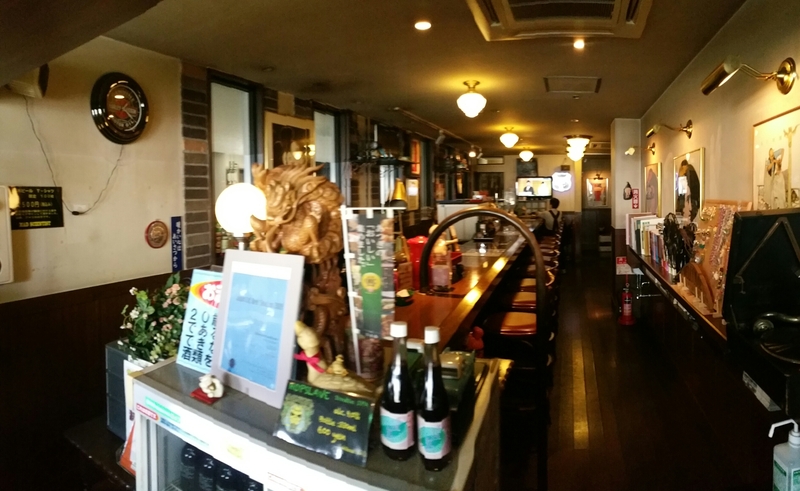 Lambic has always been a bar that I’ve wanted to get to but found it to be inconvenient – it’s located in the Atsugi area, but is about a fifteen minute walk from Hon-Atsugi station on the Odakyu line. I’ve enjoyed a lot of their beers too in bottles so when the interview came up, it was the perfect chance to get down there and try some of the beers at the source. It isn’t a difficult place to find though, as you come out of the station and walk straight, you’ll get there. There are two floors to Lambic, with the first floor housing both the brewery and a small bar area, and the second with the main restaurant area. On the day we went, only the first floor was open though it was busy with a lunch crowd milling around. The first floor has space for about 10 people at the counter and three tables set against the wall. The atmosphere seemed a cross between an American road stop cafe and a British pub. 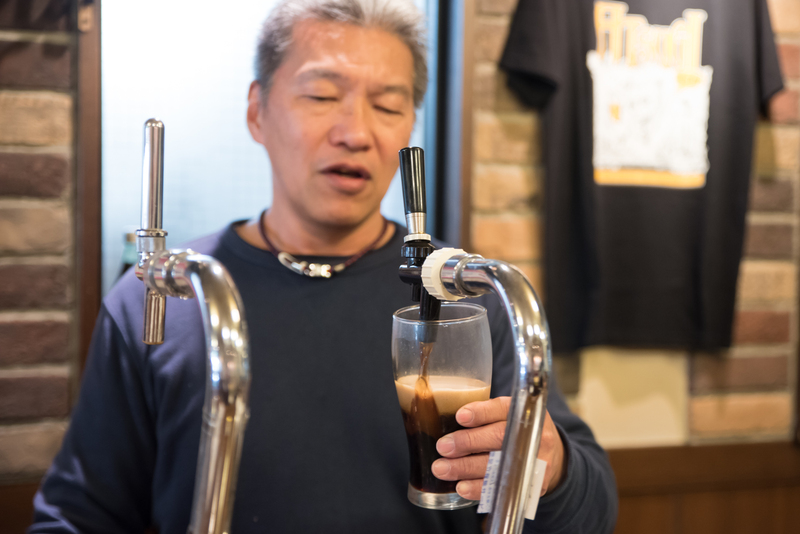 The environment was very chilled out with the staff mingling with customers and Mochizuki-san pulling the beers behind the bar. It’s great to see the brewers behind the bar and getting feedback from customers as well. If there was a table charge, then we must have missed out on it as it wasn’t included in the bill. Cheap prices for large beer. What’s not to like? The beers at Lambic are all in-house beers with some contract brews that Atsugii Beer do for other bars, such as Thrash Zone and Beer Pub Camden. Beers. Beers come in two sizes with medium being ¥480 to ¥570 for what seemed a UK half-pint (284ml) and large being ¥690 to ¥900 for a UK pint size (564ml) for the regular beers. The in-house Belgian style beers came in wine glass sizes with the half size being about 150ml and the large being about 300ml. All the prices included tax as well so very good value for money as well. There are also bottles at the front counter which can be bought and taken away as well. Unfortunately, we had just missed the last orders for food at Lambic. We managed to check out the menus and it seemed that there was a full array of meals and side dishes too. The ones we saw people eating looked voluminous, in particular the hamburg steak. Like the drinks menu, the food menus were in Japanese only though the staff did help to explain what each item was. The nearest station to Lambic is Hon-Atsugi on the Odakyu Main Line. It’s about a fifteen to twenty minute walk from the north exit. Walk straight, following the road around until you turn left at route 60. Lambic is on your left. If you want to take the bus, then number 厚16 will drop you off nearby.